US architecture firm SOM has released new images of the proposed Moynihan Train Hall expansion at New York’s Pennsylvania Station, which would turn an old post office into a grand waiting room for Amtrak. 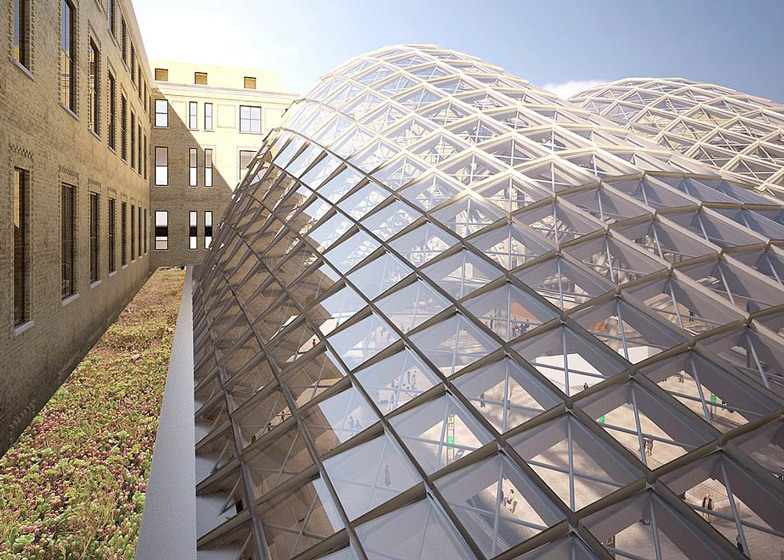 The 486,000-square-foot (45,000-square-metres) hall would feature a curved glass roof set inside the 1903 Farley Post Office building, originally designed by McKim, Mead & White. The long-stalled project was recently revived by New York Governor Andrew Cuomo, as a part of the larger renovation of Pennsylvania Station (Penn Station), which is located across the street from the Farley Post Office Building. The Moynihan Train Hall renovation would accommodate passengers of the national railway, Amtrak, alleviating congestion in the existing station facility. It would feature four bays of arched glass roofing springing from existing steel trusses. Behind the waiting room, a second area, also featuring a glazed roof, would be converted into a shopping and dining arcade. The plan also calls for new wheelchair accessible entrances flanking the building's monumental staircases. A new block-wide pedestrian tunnel would be built under 33rd Street connecting Moynihan with Penn Station. The governor’s proposal calls for a $325 million injection of government funds into the $3 billion total project, of which Moynihan Hall is just one part. Cuomo is currently soliciting real estate development proposals that would bridge the funding gap in exchange for control of the retail space and air rights at the station to build residential or office building nearby. Penn Station is the busiest train station in the US, with more than 650,000 daily users passing through it from intercity and commuter rail lines, as well as the New York City Subway. Dangerously overcrowded, the current facility, which is located under the Madison Square Garden arena, is only designed to accommodate 200,000 daily riders. The new waiting room is named after the late US Senator Daniel Patrick Moynihan, who championed the idea of bringing passengers into the Farley building. It was designed by the same architects as the original Pennsylvania Station, which was demolished in 1961. SOM estimates the project could be completed by 2018. Other recent railway stations include UN Studio's depot in Arnhem, the Netherlands, the Crossrail station at Canary Wharf in London by Foster + Partners, and a elevated train stop in Chicago wrapped in a perforated tube by Ross Barney Architects. Images are by SOM|courtesy Governor Andrew Cuomo's office.